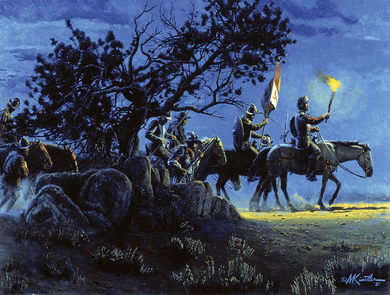 Mort Kunstler Handsigned and Numbered Limited Edition Giclee on Canvas:"Conquistadores, Los"
About the Art: At the beginning it was Spain that created the largest of American empires, perhaps the largest of world empires: her conquistadores and priests overran the islands of the Caribbean, toppled the Aztec Empire in Mexico and that of the Inca in Peru, and even, for awhile, absorbed Portuguese Brazil. When the Americans made their bid for independence, the Spanish dominions in America stretched from Florida westward to the Pacific, from the Straits of Magellan all the way north to the Bay of Saint Francis and even to Nootka Bay on Vancouver Island. That empire endured in one way or another for four centuries - from the first landfall of Columbus in 1492 to the Cuban War of 1898, which finally ousted Spain from her last American stronghold. Yet although the Spanish empire is gone, Spanish culture and language and faith linger on; even today the Iberian languages are spoken by more people in the two American continents than English.